Peruvian Sidro Daughter and The Silversmith Granddaughter. 1st Place Bred and Owned Yearling Male New Jersey Show 2007 - even over the whites! 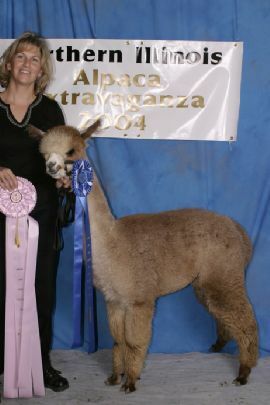 1st Place Halter - Empire Extravaganza 2008 - 15 in the class! 1st Place Halter - OABA Alpacafest 2008 - 12 in the class! Her next cria, Benchmark's Vincent by Accoyo Babe, is an amazing light rose gray. 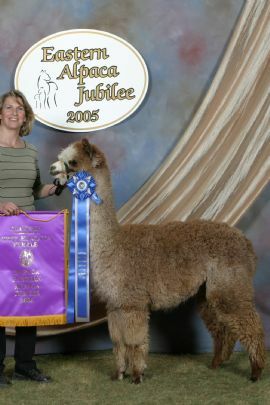 Vinny has followed suite with an impressive show record and impressive style including COLOR CHAMP at the 2010 National AOBA show as a three year old breeding male. 2009 gave us Kersee - who also placed at the top of every class she entered. Kersee is the result of breeding Vidaloo to our boy - Arrow. 2010 is Wilma and she is a Dark Rose Gray -- with exceptional fineness and high frequency crimp. 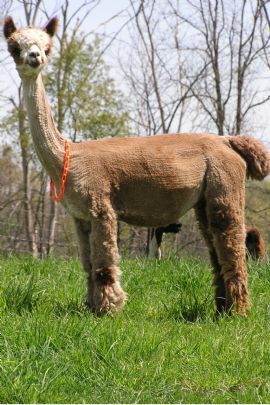 Wilma's sire is Yago and we were so impressed with Wilma, we bred Vindaloo back to Yago for her 2011 cria. 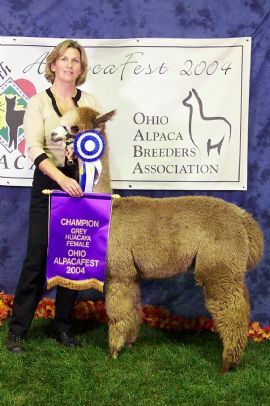 1st Place Halter - KY Classic 2005 - Best Conformation and Most Dense Fleece in the class, "Judge - Dr Julio Sumar, Peru"
Color Champion - OABA 2004 - a level 5 show with over 900 Alpacas. There were 45 Gray females competing!